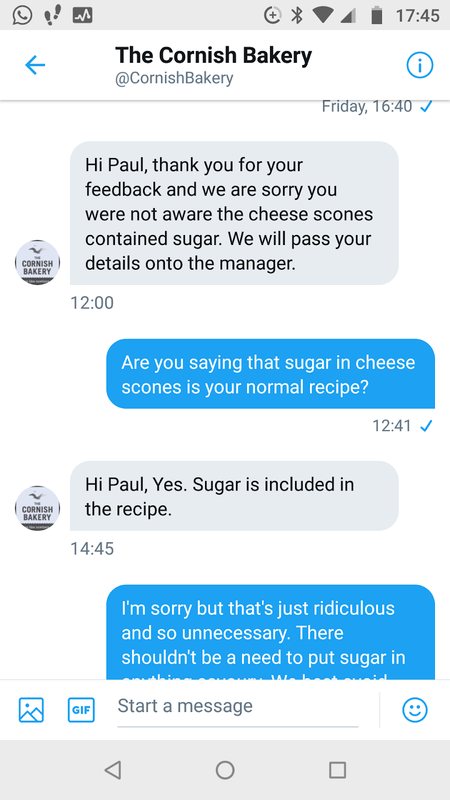 What kind of weirdo adds sugar when making cheese scones? Sugar? Well The Cornish Bakery think it’s acceptable. A little while ago we had a couple of cheese scones from The Cornish Bakery in Southwold. We didn’t eat them in Southwold but ‘ate’ them later at home in Norwich. I say ate but in reality very little was consumed. On first biting into them you could tell that they had an awful lot of sugar in them. They would have been very sweet even for sweet scones. But high sugar content with cheese just tasted vile. Utterly vile. My partner took one bite and said ‘they’ve got sugar in them’ and being a diabetic didn’t eat any more. I got a bit further. I don’t like to waste food so ate several bites but in the end I just had to give up. It was hardly practical to take them back to the shop so I complained via Twitter. 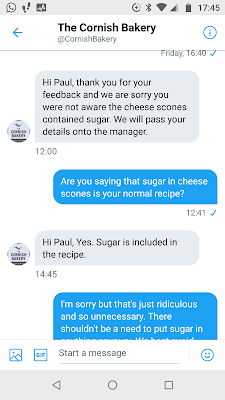 Apart from gleaning that they do actually have sugar in their recipe, a brief apology and them asking for my email address I have heard no more. No offer to refund our money. Very poor customer service. I’ve consulted several recipes to make sure it is not me that’s out of step, but none of them suggest putting sugar in them. No wonder we have a problem with obesity, type two diabetes and other sugar related problems when companies do this sort of thing.